However, while U.S. ratification is indispensable, the United States is not the only country where approval faces strong opposition. In Canada and Japan, which were the last two countries to join the talks due to opposition from domestic political constituencies, the agreement is no less controversial and is increasingly entwined in electoral politics. And given the agreement’s provisions for coming into force — at least six countries with a GDP totaling at least 85% of the group’s total GDP must ratify it — it may be difficult to bring TPP into being without all three . In Canada’s case, TPP will be tested by the change of government following the October 19 general election, in which the Liberal Party led by Justin Trudeau unseated Conservative Prime Minister Stephen Harper. However, the incoming Trudeau government is unlikely to back out of TPP or call for serious revisions to the agreement reached by the Harper government. During the campaign, Trudeau said his party “strongly supports free trade” and promised a “responsible approach” to the ratification process. But ratification could still take time as the new government studies the agreement and devises measures to assist sectors harmed by its provisions. For Japanese Prime Minister Shinzo Abe, meanwhile, the announcement of a TPP agreement came at an ideal time politically. Having seen his approval ratings weakened due to the lengthy parliamentary debate over legislation that will change to Japan’s national security framework, the successful conclusion of TPP negotiations provides an excellent opportunity for the Abe administration to refocus its attention on economic reform. It is also a personal victory for the prime minister, who early in his tenure had to overcome strident opposition to Japanese participation in the talks from members of his own Liberal Democratic Party (LDP). Although the public obviously has not seen the final agreement, polls taken after the agreement was announced show that the public largely supports it. A poll by national broadcaster NHK found that 53% of respondents either “greatly approved” (8%) or “to some extent approved” (45%) the agreement, compared with 29% who “did not much approve” or 8% who “did not approve at all.” Similarly, a poll by the financial newspaper Nihon Keizai Shimbun found 49% of respondents approved and only 26% disapproved of the agreement. Despite support from the public at large, however, the ratification process still could prove to be politically contentious. Perhaps the main problem is that in summer 2016 Japan will hold an election for the House of Councillors (HOC), the upper house of the Japanese Diet, in which half of the chamber’s 242 members will face reelection. The HOC has long suffered from significant malapportionment that gives substantially more weight to voters in sparsely populated rural regions than those in densely populated metropolitan areas, an imbalance that has only been partly corrected by a redistricting plan that passed the Diet in July. Because predominantly rural prefectures tend to elect only one HOC member per election cycle, they also tend to be the most competitive races in HOC elections. As a result, TPP could prove a heated campaign issue even if a plurality or majority of voters approve of it, due to potential opposition from farmers and agricultural cooperatives. Opposition parties already may be trying to catalyze resistance to the agreement. Whether they are able to do so will depend in part on their ability to reach a unified position on TPP and coordinate on where to field candidates. For the moment, there are some significant differences between the parties. The Democratic Party of Japan’s (DPJ) initial response is not unlike the response of critics in the United States and other countries: the party is not necessarily opposed to TPP — which would be a hard position to take given that TPP participation was pursued by DPJ prime ministers. Instead, the DPJ contends the Abe government failed to defend Japan’s national interests in the talks. The Japan Restoration Party (JRP), the second-largest opposition party, praised the agreement, stressed that trade is an opportunity to expand opportunities for consumers, and argued that more reforms are needed to boost Japan’s competitiveness. Finally, the Japan Communist Party (JCP) is categorically opposed to TPP. Perhaps the only argument these parties have in common is that the Abe government should be more transparent about the substance of the agreement and should respect dissenting opinions. But given the ruling coalition’s dominance of both houses of the Diet, dissent within the Liberal Democratic Party (LDP) could be a more meaningful obstacle to ratification than the opposition parties. The LDP has been historically ambivalent about free trade, thanks in no small part to the influence of agricultural interest groups and other producer groups within the party. Survey data collected by a joint University of Tokyo/Asahi Shimbun project shows that among winning LDP candidates in recent House of Representatives and House of Councillors elections, supporters of free trade are greatly outnumbered within the party’s parliamentary delegation (see charts for details). 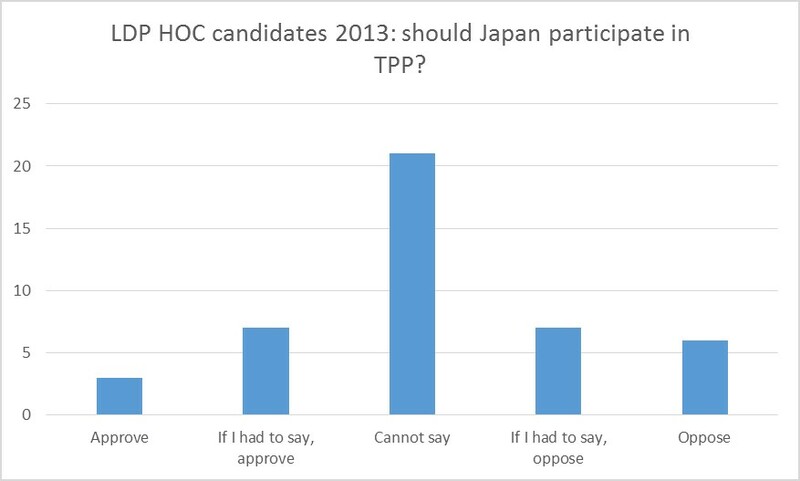 The high number of “cannot say” replies suggests that the level of support may be understated (among the candidates in the 2014 general election who replied “cannot say” were Prime Minister Abe and Economy Minister Akira Amari, who represented Japan in the TPP negotiations), but if LDP members believe they cannot openly support free trade, that still shows the party’s ambivalence. Many LDP members, of course, are not ambivalent about free trade and have voiced their outright opposition to Japan’s participation in TPP. Nearly 200 HOR members and nearly 60 HOC members, mostly from the LDP, formed a parliamentary league to resist Japanese participation. Then, after Abe decided to participate in March 2013, those members pressured the prime minister to defend Japan’s national interests and uphold a parliamentary resolution calling on the government to defend sensitive agricultural products like rice, wheat, meat, dairy, and sugar in negotiations. During the negotiations, these members roundly criticized the government at the slightest hint that its resolve in TPP talks was weakening and cooperated with the Central Union of Agricultural Cooperatives (JA-Zenchu), the primary target of the Abe administration’s agricultural reforms thus far, to rally farmers against compromise. With TPP in hand, the battle between the Abe administration and the agricultural sector and its allies in the LDP will shift again, into a game of tug-of-war over measures intended to shield farmers from the worst effects of TPP. Although the agricultural sector’s initial response to the framework agreement was harsh — the JA Group declared that the agreement violated the Diet resolution and the Nihon Nogyou Shimbun, JA’s in-house newspaper, published an editorial declaring that the agreement “trampled national interests underfoot” — it may be more appropriate to view the agricultural sector’s response as the opening bid in negotiations with the Abe government regarding TPP countermeasures rather than a declaration of war against ratification. The reality is that JA-Zenchu and its LDP allies have little ability to block ratification. Given the government’s 87 seat majority in the HOR, it would take a virtually unprecedented parliamentary rebellion to block ratification. While the margin is smaller in the HOC — the coalition holds a slender 12-seat majority — Article 61 of the Japanese constitution mandates that if the HOC rejects or fails to consider within 30 days a treaty passed by the HOR, the HOR’s version passes automatically. The Diet passed the ASEAN-Japan Comprehensive Economic Partnership (AJCEP) in this manner in 2008 because the Fukuda government was unable to win the consent of the DPJ-controlled HOC. Meanwhile, under Abe the LDP is more firmly controlled by the prime minister and other party leaders than during previous episodes of parliamentary rebellion. With senior leaders and faction heads lined up behind the prime minister, any putative rebel would face severe punishment, more so even than in the 2005 postal rebellion against then-Prime Minister Junichiro Koizumi, which included a number of high-ranking party members. That said, in the interest of party stability and to maximize the LDP’s chances of picking up seats in the 2016 HOC election, Abe and other senior leaders are determined to mollify opponents and forestall an intra-party dispute. The parliamentary calendar will give the administration time to appeal to voters. While the Abe government had hoped an agreement would be ready for approval in time for the autumn extraordinary session of the Diet, delays in negotiations and the difficult process of finalizing the text mean that a signed agreement will not be ready for consideration by the Diet before the spring ordinary Diet session. In practice, this means waiting until after the FY2016 budget is passed in March. As a result, the Abe government does not plan to convene an extraordinary session this year, sparing the administration from facing opposition party questioning about TPP in parliamentary committees and enabling it to make the case for TPP directly to farmers through a series of meetings that will be convened nationwide. The Ministry of Economy, Trade, and Industry (METI) plans to convene its own meetings to explain the benefits of TPP to small- and medium-sized enterprises (SMEs), another important LDP constituency. Meanwhile, immediately following the conclusion of negotiations in Atlanta, Abe announced the creation of a TPP task force, headed by the prime minister himself, which will formulate the government’s response to TPP implementation. The government is expected to finalize a supplemental budget that includes assistance for farmers and SMEs by the end of 2015, which will then be passed by the Diet in early 2016. As suggested by the TPP task force’s basic policy on the government’s response to TPP, the supplemental budget will likely only be the first step in the Abe administration’s bid to limit the impact of TPP on Japanese producers. As Aurelia George Mulgan notes, the administration already has identified ways in which it will minimize the impact of even the modest concessions it made regarding agricultural products like rice, beef, and pork. Indeed, in agriculture policy, the conclusion of TPP negotiations will give additional impetus to the Ministry of Agriculture, Forestry, and Fisheries’ (MAFF) ongoing project to develop an “industrial policy” for agriculture that shifts production into high-value-added products for export. To sell these policies to farmers, Abe tapped Hiroshi Moriyama, a member of the so-called agriculture “tribe” and outspoken TPP critic, as MAFF minister in the October 7 reshuffle. Despite these measures, the debate over TPP in the Diet could be raucous and lengthy, and will likely make the 2016 HOC election more competitive than it might be otherwise. As a result, the price tag for agricultural subsidies and other countermeasures could be steeper than initially expected as producer groups bargain with the Abe government ahead of the election. Meanwhile, it is possible that the government could delay a vote on TPP until after the election: in a recent press conference, Toshihiro Nikai, chairman of the LDP’s executive council, suggested that a ratification vote did not necessarily need to be held during the spring ordinary session. Estimating the ultimate impact of TPP on the Japanese economy therefore is difficult. In a study conducted in 2012, Brandeis University’s Peter Petri and Johns Hopkins University’s Michael Plummer suggested Japan would have the most to gain in absolute terms from TPP, adding $119 billion annually to its by 2025 and increasing its exports by as much as 14.4%. The Japanese government’s own figures, which it published in March 2013 after deciding to join negotiations, concluded TPP participation could boost Japan’s GDP by as much as 0.66% annually. (The Japanese government’s model only accounts for eliminating trade barriers, unlike Petri and Plummer, who also account for liberalization of services and investment.) While the government estimated TPP participation would cause a ¥3 trillion decline in agricultural production, it suggested export gains and increases in consumption due to lower prices would more than compensate for agricultural losses. Kenichi Kawasaki, a senior fellow at the National Graduate Institute for Policy Studies (GRIPS) who has advised the cabinet on trade negotiations, estimates the benefits to Japan from TPP could be as much 1.6% of GDP annually after accounting for both the elimination of tariff barriers and non-tariff measures (NTMs). However, it is possible that these projections are optimistic. While it will be difficult to say for certain before the final text is made public, it appears increasingly unlikely that tariff reduction and deregulation achieved the levels assumed by economists. At the same time, subsidies and other assistance given to producers — particularly to farmers — could reduce incentives to exit the market or make productivity-raising investments while also limiting the benefits to consumers. Finally, as Waseda University Professor Yasuyuki Todo argues, Japan has to introduce additional measures to maximize its gains from TPP, particularly regarding foreign direct investment (FDI). Therefore, although TPP is undoubtedly a significant personal achievement for Abe, reaching an agreement is only the first step. The Japanese government, like the U.S. government and other negotiating partners, has work to do to convince voters and interest groups that it got the best possible deal, that the country as a whole will benefit, and that the “losers” from liberalization will be compensated. While many observers assumed TPP would provide a boost to the “third arrow” of Abenomics, a package of industrial policies and regulatory reforms intended to increase Japan’s productivity and competitiveness, it will not do so automatically. It is up to the Abe government to use the conclusion of TPP as an opportunity to push for reforms that promote genuine transformation in the agricultural sector, encourage SMEs to enhance productivity, and make Japan a more welcoming site for foreign direct . Tobias Harris is the Fellow for Economy, Trade and Business at Sasakawa USA, specializing in topics including Japanese politics, the Japanese political economy, US-Japan economic relations, Japanese public administration and Abenomics. Read more of his research and analysis here or view Japan Political Pulse, his project that aggregates Japanese opinion polls to provide a more accurate picture of the government’s public approval rating, here.